CRS Report: Iraq Map Sources [.pdf] - This report for Congress identifies selected Web sites for maps of Iraq. Maps of the Middle East, Iraq, and the No-Fly Zone are provided. Humanitarian Information Centre for Iraq: Map Centre - Map catalogue, geographic maps, thematic maps, GIS center, Meta-data. New York Times: Iraqi Ground Forces - Interactive map of Iraqi forces. Perry-Castañeda Library Map Collection: Iraq - Country maps, city maps, detailed maps, thematic maps, historical maps, and links to maps on other web sites. See Baghdad and Vicinity, Distribution of Ethnoreligious Groups and Major Tribes, Kurdistan, Oil Infrastructure, Reference, and Terrain Conditions maps. Perry-Castañeda Library Map Collection: Middle East - Reference, special and historical maps of the region. See Turkey SE which includes Northern Iraq, Lebanon, and Syria with and an inset of the Tigris and Euphrates. ReliefWeb Map Centre: Iraq - Humanitarian planning map, cross border operations concept map, explosive locations map, potential transport corridors, Iraq food storage sites. 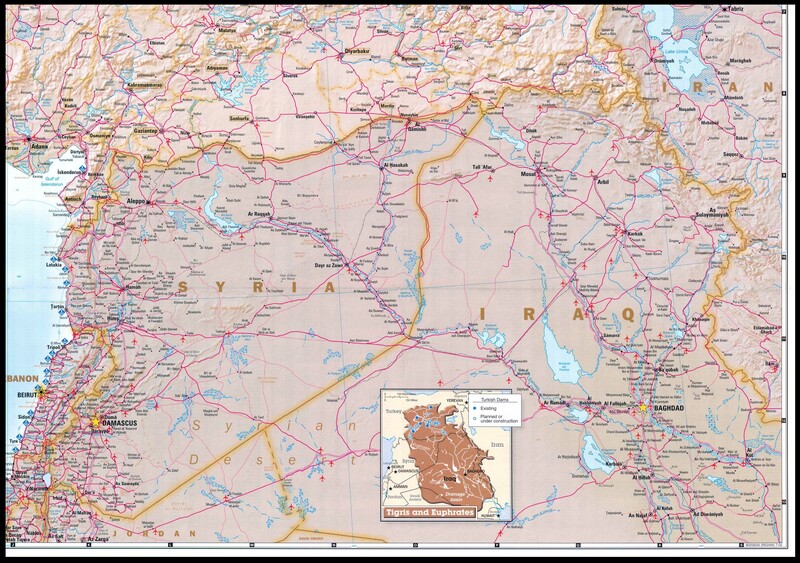 United Nations Cartographic Section: Iraq Map [.pdf] - A detail map of Iraq. Abu Ghraib (aka Abu Ghurayb) Prison - GlobalSecurity.org backgrounder. Also see Seymour Hersch's Torture at Abu Ghraib (30 Apr 04) about American soldiers' brutalization of Iraqis at the prison, the first in an ongoing series of articles at The New Yorker. Academic Info: Iraq Studies Gateway - Compilation of resources on the Iraq crisis and war, news and media resources, and ancient Mesopotamia. Airwars - Monitoring the international coalition's airstrikes against Islamic State (Daesh) in Iraq and Syria. Archiving official reports of the war. Verifying claims of non-combatant civilian casualties. Promoting accountability of the US and its allies. American Arab Anti-Discrimination Committee (ADC) - Advisory Board members include: Muhammad Ali, Her Majesty Queen Noor, several U.S. Congressmen, Edward Said & Casey Kasem among others. ADC has members in all 50 states - and it is the largest Arab American organization of its kind. American Kurdish Information Network (AKIN) - Information on events taking place in the Kurdish regions of Turkey, Iran, Iraq and Syria. Arab League - The League of Arab States at Al-Bab.com. Arab Net: Iraq - Gateway to Iraq history, geography, business, culture, transport. Article 15-6 Investigation of the 800th Military Police Brigade (.pdf; 53 pp.) - Executive summary prepared by Major General Antonio M. Taguba of the U.S. Army on abuse of prisoners at the Abu Ghraib Prison in Baghdad. Back to Iraq - Blogger and former AP and New York Daily News reporter Christopher Allbritton's site. Baghdad Burning - Weblog covering war, politics, occupation in Iraq. Bush's War - PBS Frontline documentary on Iraq war and occupation. Butler Committee Report on Weapons of Mass Destruction - The Committee under Lord Butler established by the Prime Minister conducted a Review of Intelligence on Weapons of Mass Destruction. The completed report [.pdf, ] was issued 14 July 2004. Carnegie Endowment for International Peace: Iraq - News, analysis, and key documents on the U.S. administration's plans for regime change in Iraq. Christian Peacemaker Teams (CPT) in Iraq - CPT initiated a long-term presence in Iraq in October 2002, six months before the beginning of the U.S. led invasion in March of 2003. The primary focus of the team for eighteen months following the invasion was documenting and focusing attention on the issue of detainee abuses and basic legal and human rights being denied them. Issues related to detainees remain but the current focus of the team has expanded to include efforts to end occupation and militarization of the country and to foster nonviolent and just alternatives for a free and independent Iraq. CIA World Factbook: Iraq - Background, geography, people, government, economy, communications, military, and transnational issues. CIVIC Worldwide - Working to obtain U.S. Government assistance for communities and families in Afghanistan and Iraq, while helping to shine a spotlight on the human costs of war. Coalition Provisional Authority: Origin, Characteristics, and Institutional Authorities (.pdf, 38 pp.) - CRS report for U.S. Congress, 29 Apr 04. Coalition Provisional Authority Office of the Inspector General - In Public Law 108-106 (.pdf, 31 pp.) Congress created the position of Coalition Provisional Authority Inspector General (CPA-IG). The CPA-IG delivers Quarterly Congressional Reports outlining the key findings and progress to date. These findings will outline deficiencies and the corrective actions taken to improve reconstruction programs. The CPA-IG has also established a Fraud and Abuse Hotline. 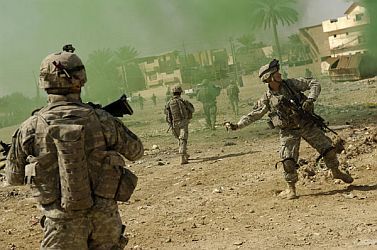 Combat Duty in Iraq and Afghanistan, Mental Health Problems, and Barriers to Care - New England Journal of Medicine article by Charles W. Hoge, M.D., et al. This study provides an initial look at the mental health of members of the Army and the Marine Corps who were involved in combat operations in Iraq and Afghanistan. Its findings indicate that among the study groups there was a significant risk of mental health problems and that the subjects reported important barriers to receiving mental health services, particularly the perception of stigma among those most in need of such care. Commission on Wartime Contracting in Iraq and Afghanistan - An independent, bipartisan legislative commission established to study wartime contracting in Iraq and Afghanistan. Created in Section 841 of the National Defense Authorization Act for Fiscal Year 2008, this eight-member Commission is mandated by Congress to study federal agency contracting for the reconstruction, logistical support of coalition forces, and the performance of security functions, in Iraq and Afghanistan. Comprehensive Report of the Special Advisor to the Director of Central Intelligence on Iraq's Weapons of Mass Destruction - Prepared by Charles Duelfer, chief weapons inspector for the Iraqi Survey Group. This report is in three volumes, comprising 1000 pages and dated 09/30/2004. Collateral Murder - WikiLeaks has released [on 04/05/2010] a classified US military video depicting the indiscriminate slaying of over a dozen people in the Iraqi suburb of New Baghdad -- including two Reuters news staff. Reuters has been trying to obtain the video through the Freedom of Information Act, without success since the time of the attack. The video, shot from an Apache helicopter gun-site, clearly shows the unprovoked slaying of a wounded Reuters employee and his rescuers. Two young children involved in the rescue were also seriously wounded. Costs of War - The goal of the Costs of War project has been to outline a broad understanding of the domestic and international costs and consequences of the wars in Afghanistan, Iraq, and Pakistan. Documented by the Eisenhower Study Group at Brown University's Watson Institute for International Studies. Council on Foreign Relations: Iraq - Related readings on Iraq. Compiled within the following sections: Background, The Bush Administration Case for Iraq, Iraq's Response, the U.S. Congress and Iraq, United Nations and Iraq, U.S. allies, Weapons of Mass Destruction, Costs of War with Iraq, Alternatives to War, Aftermath to War. Country Reports: Iraq - Background information on Iraqi economy, defense, geography, government, history, and people. Crude Designs - Control of Iraq's future oil wealth is being handed to multinational oil companies through long-term contracts that will cost Iraq hundreds of billions of dollars. Crude Designs: The Rip-Off of Iraq's Oil Wealth reveals that Iraqi oil policy will allocate the development of at least 64% of Iraq's reserves to foreign oil companies. Iraq has the world's third largest oil reserves. Defense Procurement and Acquisition Policy (DRAP) - Iraq reconstruction contract information. Denis Halliday - Former UN Assistant Secretary General, Halliday headed the UN "oil-for-food" program until he resigned in 1998 in protest over continued sanctions on Iraq. Various interviews. Downing Street Memo, The - The Downing Street "Memo" is actually a document containing meeting minutes transcribed during the British Prime Minister's meeting on July 23, 2002 - eight months prior to the invasion of Iraq in March 2003. Since that time, much more information has come to light through leaks of secret government documents and the accounts of an increasing number of people who have witnessed the administration's wrongdoing firsthand. Education for Peace in Iraq Center (EPIC) - Works to improve the human condition in Iraq by educating and mobilizing the American public to affect nonviolent social change as well as a shift in U.S. foreign policy. EPIC's goals are carried out through its three main programs: Advocacy, Media, and Iraq Speakers Bureau. Electronic Intifada, The - Palestinian point-of-view coverage of the Israeli-Palestinian Conflict. Embassy of the United States Baghdad, Iraq - Official site. European Union: External Action - Iraq - Latest news and resources. Fallujah Satellite Imagery - From GlobalSecurity.org. Family News Network of the International Committee of the Red Cross - Maintained by the ICRC tfor victims of the Iraq conflict to accelerate the process of restoring contact between separated family members and to facilitate the exchange of family news. Global Policy Forum: Iraq Conflict - Archives. Global Security: U.S. Forces Order of Battle - This is a "best available" order-of-battle of forces deployed in CENTCOM's part of Southwest Asia, as well as EUCOM forces in Turkey. Grotian Moment - Saddam Hussein trial blog. Also see English translation of the 24-page opinion issued by the Iraqi High Tribunal Appellate Chamber in the Dujail Trial and English translation of the 298-page opinion issued by the Iraqi High Tribunal Trial Chamber in the Dujail Trial. Hans von Sponeck - Served as a UN Assistant Secretary-General and UN Humanitarian Coordinator for Iraq. After Denis Halliday resigned as UN Humanitarian Coordinator for Iraq in October 1998, von Sponeck took over, heading all UN operations in Iraq and managing the Iraqi operations of the Oil-for-Food program. Von Sponeck together with Jutta Burghardt, head of the UN World Food Programme in Iraq, resigned in February 2000 for the same reason as Halliday, to protest UN's Iraq sanctions policy. Von Sponeck and Halliday wrote an article in The Guardian (The Hostage Nation) explaining their position, accusing the sanctions regime of violating the Geneva Conventions and other international laws and causing the death of thousands of Iraqis. Honor the Fallen - A photo tribute to the men and women of Operation Irai Freedom. Human Rights Watch: Middle East/North Africa - News releases from Human Rights Watch, an independent nongovernmental organization (NGO). Humanitarian Information Centre for Iraq (HIC) - An initiative of the UN Office for the Coordination of Humanitarian Affairs (OCHA). A central location for data and information to assist co-ordination of humanitarian response activities. icasualties - Monitors US and UK fatalities in Iraq and Afghanistan conflicts. Iraq Inquiry, The (UK) - The purpose of the Inquiry is to examine the United Kingdom's involvement in Iraq, including the way decisions were made and actions taken, to establish as accurately and reliably as possible what happened, and to identify lessons that can be learned. The Inquiry is considering the period from 2001 up to the end of July 2009.
International Advisory and Monitoring Board (IAMB) - An audit oversight body for the Development Fund for Iraq (DFI). The DFI was established pursuant to United Nations Security Council Resolution 1483 and holds the proceeds of petroleum export sales from Iraq, as well as remaining balances from the UN Oil-for-Food Program and other frozen Iraqi funds. Disbursements from the DFI must be used for the benefit of the Iraqi people, and are directed by the Coalition Provisional Authority, in consultation with the Iraqi interim administration. The IAMB will continue to function after the dissolution of the Coalition Provisional Authority on June 30, 2004 and will work with the Interim Government of Iraq, as set out in United Nations Security Council Resolution 1546.
International Committee of the Red Cross (ICRC) in Iraq - Special section on the war in Iraq includes news, operational updates and background material, information on the Geneva Conventions and the treatment of prisoners of war, and information on international humanitarian law. International Institute for Strategic Studies (IISS): Gulf and Middle Eastern Security - Strategic analysis and review on the conflict in Iraq. International Law Aspects of the Iraq War and Occupation - Examines the legality of the US-UK war on Iraq. Shortly before the outbreak of hostilities, UN Secretary General stated that the use of force without Council endorsement would "not be in conformity with the Charter and many legal experts now describe the US-UK attack as an act of aggression, violating international law. Experts also point to illegalities in the U.S. conduct of the war and violations of the Geneva Conventions by the U.S.-UK of their responsibilities as an occupying power. The section also looks at wartime violations on the Iraqi side. Iraq: Brookings Institution - Brookings Institution scholars write about Iraq. Iraq Occupation - FAIR's resources on Iraq. Iraq Afghanistan Veterans of America PAC (IAVA PAC) - The goal of the IAVA PAC is to put Iraq and Afghanistan War Veterans in Congress who are critical of the execution of the war in Iraq and representative of the principles of IAVA in the US Congress. Iraq Body Count - A project to establish an independent and comprehensive public database of civilian deaths in Iraq resulting directly from military actions by the USA and its allies in 2003. Results and totals are continually updated and made immediately available on this page. Casualty figures are derived from a comprehensive survey of online media reports. Where these sources report differing figures, the range (a minimum and a maximum) are given. Iraq Coalition Casualties (icasualties.org) - Documenting coalition casualties. Iraq Connection Al Qaeda-Hussein Link Is Dismissed - Article by Walter Pincus and Dana Milbank (Washington Post, 17 Jun 04) reporting September 11 Commission finding of no "collaborative relationship" between Iraq and al Qaeda, challenging one of the Bush administration's main justifications for the war in Iraq. Iraq Country Analysis Brief - Backgrounder from the U.S. Department of Energy. Iraq Facilities - Camps, forward operating bases, air bases and airports, former presidential palaces, other locations in Iraq. Iraq Foundation - A a non-profit, non-governmental organization working for democracy and human rights in Iraq, and for a better international understanding of Iraq's potential as a contributor to political stability and economic progress in the Middle East. Iraq Index (The Brookings Institution) - A statistical compilation of economic and security data. Provides updated information on various criteria, including crime, telephone and water service, troop fatalities, unemployment, Iraqi security forces, oil production, and coalition troop strength. Iraq Liberation Act of 1998 - H.R. 4655. Public Law: 105-338 (10/31/98). Declares that it should be the policy of the United States to seek to remove the Saddam Hussein regime from power in Iraq and to replace it with a democratic government. Iraq Memory Foundation - Engaged in a long-term effort to provide Iraqi society and the world a view of the inner workings of the Ba'thist institutions of repression and social control that dominated all aspects of Iraqi life between 1968 and 2003. Iraq Oil-for-Food Programme: Independent Inquiry Committee Report - On 07 Sep 05, the Independent Inquiry Committee issues its definitive report on the overall management and oversight of the "temporaryOil for Food Programme, a programme which stretched to seven years with more than $100 billion in transactions (over $64 billion in oil sales and almost $39 billion for food). Iraq on the Record - Prepared at the direction of Rep. Henry A. Waxman, the Iraq on the Record Database is a searchable collection of 237 specific misleading statements about the threat posed by Iraq made by the five Administration officials most responsible for providing public information and shaping public opinion on Iraq: President Bush, Vice President Cheney, Defense Secretary Rumsfeld, Secretary of State Powell, and National Security Advisor Rice and the Iraq on the Record Report is a comprehensive examination of these statements. Iraq Policy Information Project (Iraqpolicy.com) - Attempts to spur informed debate about Bush administration policy toward Iraq and to broaden U.S. media coverage of the Iraq crisis. Iraq Reconstruction (Global Security.org) - Cost of Reconstruction, Economic Stability, Food and Humanitarian Assistance, Government Contracts, Highway and Road Security, Iraqi Governing Council, Justice and Reconciliation, Military Reconstruction, Oil, Post-Conflict Security, Role of UN, Sanctions, Transitional Administration, Who's Who, Women in Democracy Building. Iraq Reconstruction Task Force - U.S. Department of Commerce link to information about the rebuilding of Iraq. Iraq Resource Center - Council on Foreign Relations backgrounder and resources. Iraq Revenue Watch - Monitoring Iraq reconstruction funds, contracts, oil. An initiative from the Open Society Institute. Iraq Sanctions Regulations [.pdf] - An overview of the Iraqi Sanctions Regulations -- Title 31 Part 575 of the U.S. Code of Federal Regulations. Iraq Special Weapons Guide - Iraq special weapons reports, documents, and news maintained by the Federation of American Scientists (FAS). Iraq Special Weapons Proliferation News - Nuclear, biological, chemical and missile proliferation news maintained by the Federation of American Scientists (FAS). Government Documents - US and foreign sources, including official reports, letters, testimonies, legislation, and policy statements. Iraqi Entities - A searchable database of Iraqi entities - persons, companies, institutes, government agencies - that are thought to be connected to Iraq's nuclear, chemical, biological or advanced conventional weapons programs or to its missile programs. Iraqi Suppliers - A database of entities - persons, companies, governments - that are thought to have supplied technology, equipment or expertise to Iraq's nuclear, chemical, biological or advanced conventional weapons programs or to its missile programs. WMD Profiles - Brief histories of the nuclear, chemical, biological and missile programs of Iraq. Iraq: The Cradle of Civilization at Risk - Cultural heritage and historical monuments in Iraq. Iraq: The Petroleum Exploration and Production Handbook (Dec. 2004) - Information about this handbook by Michael A. G. Bunter describing oil investment opportunities in Iraq in terms of its technical, legal/contractual, fiscal and geopolitical perspectives. Iraq's Governing Council - Information backgrounder from the Council on Foreign Relations. Published May 17, 2004. Iraq Study Group - At the urging of Congress, the United States Institute of Peace facilitated the Iraq Study Group, led by co-chairs James A. Baker, III, former secretary of state and honorary chairman of the James A. Baker III Institute for Public Policy at Rice University, and Lee H. Hamilton, former congressman and director of the Woodrow Wilson International Center for Scholars. Iraqanalysis - The core of this site is an index of information sources about post-invasion Iraq. This includes a list of opinion polls carried out in Iraq, links to documents about the humanitarian situation, a collection of news sources about Iraq, and much else. This site supercedes the Campaign Against Sanctions on Iraq which is still maintained as an archive of sanctions-related dociuments and other materials by the Iraq Analysis Group. Iraqi Communist Party - Official site. Iraqi News - Breaking news from Baghdad on the U.S. occupation of Iraq from online newspapers and international news sources. Iraqi Sanctions: Myth and Fact - Jeff Lindemeyer article published by Voices in the Wilderness on Sept. 30, 2001. IraqJournal - A collection of reports from Iraq, coordinated by independent journalist Jeremy Scahill. Iraqometer - Basic statistic facts on the conflict. Iraq's Weapons of Mass Destruction Programs (October 2002) - CIA report on WMD in Iraq. Filled with outright lies, misdirection and redactions. Joint Intelligence Committee Dossier on Iraq's Weapons of Mass Destruction [.pdf, 53 pp.] - UK intelligence report on WMD issued 24 September 2002. Journalist's Guide to the Geneva Conventions - Online guide from the Society of Professional Journalists. Includes a history of the Geneva Conventions, the full texts of the Conventions, and alphabetical reference guide. Use the Quick Guide to find out what the Geneva Conventions say about everything from access to grave sites to wounded prisoners of war, fully linked to the original treaties. Kurdistan Democratic Party (KDP) - Official site. Lie by Lie: Chronicle of a War Foretold: August 1990 to March 2003 (Mother Jones) - What did U.S. leaders know and when did they know it? An Iraq War timeline project. Lost Treasures from Iraq - In the days following the conquest of Baghdad the Iraq Museum was looted. Reports on the damage vary--the number of lost or stolen objects varies between 50,000 to 200,000. This site contains Oriental Institute images of objects from the Iraq Museum, sorted by categories. Other images were scanned from books and are posted here with permission of the publishers. In addition, several institutions and individuals contributed pictures from their own holdings. Measuring Stability and Security in Iraq - Quarterly reports from the U.S. Department of Defense. Middle East Librarians Association Committee on Iraqi Libraries - A private, non-profit, non-political organization of librarians and others interested in those aspects of librarianship which support the study of or dissemination of information about the Middle East. The area signified is considered to include those countries from Morocco through Pakistan as well as other areas formerly included in the Arab, Ottoman, or Mughal empires. The MELA Executive Board convened the Committee on Iraqi Libraries to coordinate the organization's response to the damage and destruction suffered by libraries in Iraq during and after the war in March and April 2003. Middle East Research and Information Project (MERIP) - Information and analysis on the Middle East. Muslims, Islam, and Iraq - Information about Islam and Muslims in Iraq, as well as about the relationship of the U.S. war in Iraq to Islam and Muslims, including Shi'ites, Kurdish Sunnis, and Arab Sunnis. Office of the Iraq Programme (OIP): Oil-for-Food - Created in October 1997 to implement the oil for food program for Iraq. Established by Security Council resolution 986 (1995) and subsequent resolutions. Oil-for-Food Program - Established by the United Nations in 1995 (under UN Security Council Resolution 986) and terminated in late 2003, was established with the stated intent to allow Iraq to sell oil on the world market in exchange for food, medicine, and other humanitarian needs for ordinary Iraqi citizens without allowing Iraq to boost its military capabilities. The program was introduced by United States President Bill Clinton's administration in 1995, as a response to arguments that ordinary Iraqi citizens were inordinately affected by the international economic sanctions aimed at the demilitarisation of Saddam Hussein's Iraq, imposed in the wake of the first Gulf War. The sanctions were discontinued on November 21, 2003 after the U.S. invasion of Iraq, and the humanitarian functions turned over to the Coalition Provisional Authority. Program head Hans von Sponeck questioned whether such sanctions should exist at all. Speaking at the University of California, Berkeley in late 2001, he decried the sanctions, stating, "What is proposed in fact amounts to a tightening of the rope around the neck of the average Iraqi citizen"; claiming the sanctions were causing the death of 150 Iraqi children per day. He accused the US and Britain of arrogance toward Iraq by refusing to allow Iraq to pay its UN and OPEC dues and in blocking Iraqi attempts at negotiation. As the program ended, there were also revelations of corruption involving the funds. On Point II - On Point II is the US Army's first historical study of its campaign in Iraq in the decisive eighteen months following the overthrow of the Baathist regime in April 2003. The book examines both the high-level decisions that shaped military operations after May 2003 as well as the effects of those decisions on units and Soldiers who became responsible for conducting those operations. Critical chapters in this book address the decision to disband the Iraqi Army, detainee operations (including the incidents at the Abu Ghraib prison), reconstruction efforts, and the Army's response to the growing insurgency. Operation New Dawn - Official website of U.S. forces - Iraq. Patriotic Union of Kurdhistan (PUK) - Official site. Also see PUK Media Centre. Pentagon Military Analyst Program: Documents - Links to text-searchable versions of the released documents regarding the Pentagon military analyst program. The Pentagon military analyst program was launched in early 2002 by then-Assistant Secretary of Defense for Public Affairs Victoria Clarke. The idea was to recruit "key influentials" to help sell a wary public on "a possible Iraq invasion." Former NBC military analyst Kenneth Allard called the effort "psyops on steroids." PR Push for Iraq War Preceded Intelligence Findings - The U.S. intelligence community buckled sooner in 2002 than previously reported to Bush administration pressure for data justifying an invasion of Iraq, according to a documents posting on the Web today [08/22/08] by National Security Archive senior fellow John Prados. Psychoanalysts for Peace and Justice - Psychoanalysts and psychoanalytically-informed citizens gathered, in opposition to the Iraq war, with the goals of participating in the broader peace and justice movements and of bringing psychoanalytic insights to bear on the social issues confronting the U.S. and the world today. Ramsey Clark: Report to UN Security Council re Iraq (26 Jan 2000) - Comprehensive report by Ramsey Clark on the huge death tolls and devastation created by the Gulf War and the 10-year economic sanctions against the people of Iraq. Rebuilding America's Defenses (.pdf) - A report of The Project for the New American Century published in September 2000. Project participants included William Kristol, Robert Kagan, Devon Gaffney Cross, Bruce P. Jackson, John Bolton, Gary Schmidt, Roger Barnett, Thomas Donnelly, Michael Vickers, Paul Wolfowitz and others. Rebuilding Iraq - From the U.S. Department of Commerce at Export.gov. Latest developments, contract awards, business opportunities, commercial environment. Rebuilding Iraq: Resource, Security, Governance, Essential Services, and Oversight Issues (.pdf, 105 pp.) - GAO report. ReliefWeb: Iraq - The latest major documents added to ReliefWeb pertaining to Iraq. RFE/RL's Radio Free Iraq - Recent reports in Iraq prepared by Radio Free Europe/Radio Liberty. Research Guide to U.S. War on Iraq - Robin Miller. Rumsfeld's War - A PBS Frontline documentary. Saddam Hussein Trial - A selection of reference materials provided by the Law Library of Congress. Sir Christopher Meyer: Special Report - Sir Christopher Meyer's book covers the fateful period of the run-up to the war in Iraq in March 2003 - an event which on many counts must now be judged a disastrous failure for British policy. Coverage from the Guadian UK. Target Iraq - Global Security's resources on the Iraq occupation. The Wild Card: Orchestrated Deception on the Path to War - Released in January 2008, this investigation sought to document every public statement made by eight top Bush administration officials from September 11, 2001, to September 11, 2003, regarding: Iraq's possession of weapons of mass destruction and Iraq's links to Al Qaeda. Maintained by The Center for Public Integrity. U.S. Agency for International Development (USAID): Assistance for Iraq - USAID is preparing to provide humanitarian and reconstruction assistance to the people of Iraq. U.S. Department of State: Iraq - Official site. U.S. Government Iraq Reconstruction Contracts - Information and links to websites on Iraq reconstruction contracts funded by U.S. Government bilateral assistance. Maintained by the U.S. Department of State. U.S. Institute of Peace: Iraq Web Links - Links to topical categories on Iraq concerning conflict and weapons inspections. UK's Iraq Inquiry - On 6 May 2016, Sir John Chilcot wrote to the UK's Prime Minister proposing to publish the Iraq Inquiry's report on 6 July 2016. The report will "be considering the UK's involvement in Iraq, including the way decisions were made and actions taken, to establish, as accurately as possible, what happened and to identify the lessons that can be learne.."
UN Assistance Mission for Iraq (UNAMI) - A political mission established by the 2003 UN Security Council Resolution 1500 at the request of the Government of Iraq. Mandated to advise Iraq's government on advancing inclusive, political dialogue and national reconciliation, assisting in the electoral process and in the planning for a national census, facilitating regional dialogue between Iraq and its neighbours, and promoting the protection of human rights and judicial and legal reform. UN Monitoring, Verification and Inspection Commission (UNMOVIC) - Created through the adoption of Security Council resolution 1284 of 17 December 1999. UNMOVIC replaces the former UN Special Commission (UNSCOM) and continues the latter's mandate to disarm Iraq of its weapons of mass destruction (chemical, biological weapons and missiles with a range of more than 150 km), and to operate a system of ongoing monitoring and verification to check Iraq's compliance with its obligations not to reacquire the same weapons prohibited to it by the Security Council. UN Office of the Iraq Program Oil-for-Food - UN oil-for-food program in Iraq, established under Security Council resolution 986 [.pdf]. UN Resolution 1441 re Iraq Arms Inspection [.html] - Adopted as Resolution 1441 at Security Council meeting 4644, 8 November 2002. Or see UN Resolution 1441 re Iraq Arms Inspection [.pdf]. UN Resolution 1483 (21 May 03) - Sanctioned the establishment of the Development Fund for Iraq. UN Security Council - Official site. UN Security Council Resolution 986 - Adopted unanimously on April 14, 1995, after reaffirming all resolutions on Iraq and noting the serious humanitarian situation with the Iraqi civilian population, the Council, acting under Chapter VII of the United Nations Charter, established a mechanism whereby Iraqi oil exports would finance humanitarian aid to the country, which later became known as the Oil-for-Food Programme. UN Security Council Resolutions Currently Being Violated by Countries Other than Iraq - Stephen Zunes article published in Foreign Policy in Focus on 01 Oct 2002. UN Security Council Resolutions on Iraq - 1990 to 2002. UN Security Council Resolutions Relating to Iraq - A complete list of Security Council Resolutions (SCRs) involving Iraq. UN World Food Program (WFP): Iraq - From 1991-96, WFP provided $500 million of food aid. Since 1996, together with other UN agencies, WFP has helped implement the Oil-for-Food Programme. UNESCO and Iraq - United Nations Educational, Scientific and Cultural Organization (UNESCO) site devoted to the crisis in Iraq. UNICEF in Emergencies: Iraq - UNICEF. UNICEF in Iraq - United Nations Children's Fund (UNICEF) news, briefing notes, fact sheets, press releases, reports, photo galleries. UNMOVIC (United Nations Monitoring, Verification and Inspection Commission) - UNMOVIC was created through the adoption of Security Council resolution 1284 [.pdf] of 17 December 1999. UNMOVIC replaced the former UN Special Commission (UNSCOM) and continued with the latter's mandate to disarm Iraq of its weapons of mass destruction (chemical, biological weapons and missiles with a range of more than 150 km) and to operate a system of ongoing monitoring and verification to check Iraq's compliance with its obligations not to reacquire weapons prohibited to it by the Security Council. Vichy on the Tigris (.pdf) - With the now unanimous support of the 'international community', can Washington hope to recoup its gamble in Iraq? Prospects for the resistance and the Occupation, as the UN-approved government is hoisted into place. A New Left Review article (Jul-Aug 2004 issue) by Susan Watkins. War Crimes - A report on United States war crimes against Iraq to the Commission of Inquiry for the International War Crimes Tribunal by Ramsey Clark and others. War Report - Select articles, documents, and analyses on the Iraq War compiled and frequently updated by the Project on Defense Alternatives. War on Terrorism: Post-Saddam Iraq - This page offers links to selected resources on the political, economic, security, and other aspects of Iraq since the fall of the Ba'athist regime of Saddam Hussein in April 2003. War with Iraq: Costs, Consequences, and Alternatives [Dec. 2002 report] - The Committee on International Security Studies of the American Academy of Arts and Sciences examines the political, military, and economic consequences to a United States war with Iraq. White House Iraq Group (aka White House Information Group or WHIG) - The marketing arm of the White House whose purpose was to sell the 2003 invasion of Iraq to the public. The task force was set up in August 2002 by White House Chief of Staff Andrew Card and chaired by Karl Rove to coordinate all the executive branch elements in the run-up to the war in Iraq. One example of the WHIG's functions and influence is the "escalation of rhetoric about the danger that Iraq posed to the U.S., including the introduction of the term 'mushroom cloud'"
Winter Soldier: Iran and Afghanistan (2008) - The four-day event brought together veterans from across the country to testify about their experiences in Iraq and Afghanistan and to present video and photographic evidence, providing an accurate account of what has and is really happening day in and day out, on the ground. The hearings were broadcast live on radio and TV. Worker Communist Party of Iraq - Official site. World Tribunal on Iraq (WTI) - The World Tribunal on Iraq is collecting a definitive body of evidence on the illegality of the invasion and occupation that will be indispensable to the global anti-war movement, to conscientious objectors, and to students of history for years to come. Americans who oppose the war have a duty to support and participate in this crucial international effort to stand up to U.S. government lawlessness and impunity. This webpage last updated on Saturday, June 2, 2018 1:13 AM.